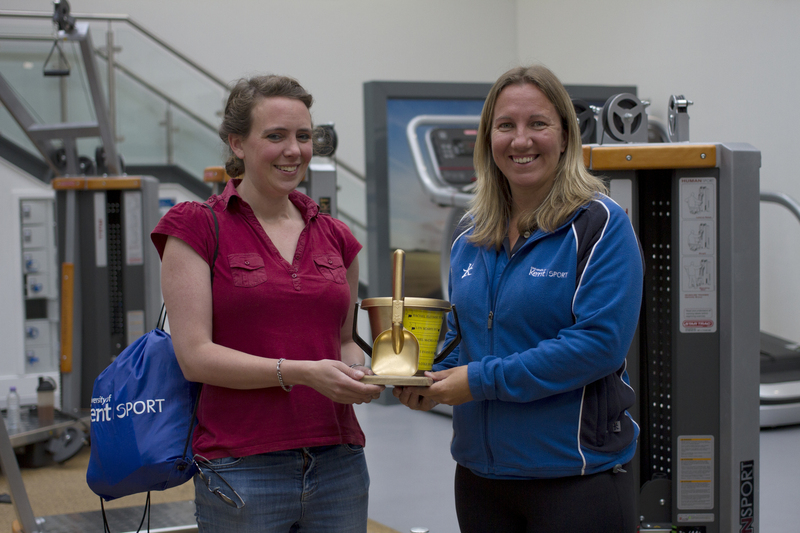 This year's Kent Sport 'Fit 4 the Beach' winner is Philippa Gregory, a PhD history student. 'Fit 4 the Beach' challenges Kent Sport members to complete an intensive five-week fitness programme tailored to each individual. During the programme, the chosen few were pushed to their limit, with one-to-one guidance and support from the Kent Sport fitness team. The fitness team have worked closely with participants showing them how they can make significant changes to the way they approach health and fitness, not just for the summer but to achieve ongoing lifestyle improvements. I first met my instructor Liz where we had a lengthy chat about what I hoped to get out of the entire process. I had one set goal beforehand, as I planned to walk 65km with a team for the CF trust. However, as my health is a major obstacle, Liz and I worked a plan around it and set some additional targets. Suffering from Cystic Fibrosis, I struggle to breathe easily without coughing and have a limited lung capacity; in addition, I have diabetes and Multiple Sclerosis, and each of these impacts in different ways. My time with Liz in the gym helped me to identify at what heart rate I began to overheat, and with this knowledge, I was better able to control my temperature by breathing deeply and slowly. (I also discovered on the day that a bottle of water over my head and the back of my neck were particularly useful as a quick fix). I feel as though in 5 weeks I have attempted to use a bit of everything in the gym, and discovered that it is all manageable. You may think Sarah appears to be a calm, relaxing influence and you may also think her style is one of gentle stretching exercises and breathing techniques. You would be wrong. For five sessions Sarah has (sometimes literally) whipped me in to shape. She has pushed me beyond what I ever thought myself capable of, corrected posture that I never assumed was incorrect and made me sweat more than I thought humanly possible. I've learnt, the hard way, that there are certain areas of my body that are far weaker than the rest of my body, and that's simply down to age and a sedentary lifestyle and working posture. A huge thank you to Kent Sport and Sarah in particular for selecting me and working with me through the process. I can't say it's always been easy, but climbing that mountain never is. I am very happy that I have been selected for this competition but I am happier because I have almost achieve my initial goal. I had the genuine opportunity from first hand to be familiar with almost all sports equipment in the fitness suite because of my instructor. During the 1-2-1 sessions he has built a programme especially for my initial goals. He made sure that I will do the predetermined exercises effectively by demonstrating me the correct movements of it and to avoid any injuries. He helped me to boost the chance of reaching my fitness goals. He also provided me useful benchmarks for improving health and daily habits. I applied for F4TB as I knew I would need something to take my mind off exam stress. Since I no longer had lectures to attend during the summer term, going to the gym in the morning and meeting up with Ben really helped solidify a routine and brought momentum to the rest of my day. Over the course of the five weeks I went from never having lifted anything heavier than my weekly food shop, to doing dead-lifts nearly my body weight. Having a personal trainer was good not only on the technical side, explaining how to do certain exercise movements, but gave structure to my workouts and made exercise more enjoyable. Overall F4TB was a really positive experience that boosted my gym confidence, and I will definitely continue to uphold my fitness. I have to say the biggest thank you to my PT Darius, who went out of his way to make sure I got all and more from the five weeks training, from emailing me to keep me on track, pushing me to complete that last rep, making sure I didn’t give up, and even gave me his banana as I had once forgotten my post workout snack. He has been a complete motivator throughout. I couldn't possibly have asked for more. Thank you. If at any point this letter about my journey through the Fit 4 the Beach contest will sound as if I am bragging, well then…YES! Yes, I am, and I do not regret anything because I am well proud of my progress [SorryNotSorry]. I would like to offer my sincere thanks to Laetitia for boarding this train with me. She was not only my PT during this journey, but also a mentor, a nutritionist, and a friend. I truly admire how you could be such a professional coach with me, when all I did was making you laugh and waste time moaning. Also, Darius for e-mailing me with the great news and offering this amazing opportunity to me. Many thanks to the rest of the Kent Sports Team who teach regular classes and assisted at the help desk! This whole experience gave me a lot more confidence in myself and reassurance in knowing that I could always ask the trainers for help if I am ever unsure in trying anything new! I am now a lot more confident to go back to my home gym and continue lifting and eating healthy to continue working towards the body and diet I want to maintain. When I signed up for Fit for the Beach, I was at a weird point in my fitness journey. I’d been committing to daily gym trips for months, trying new classes, and eating (mostly) healthy. And it worked…for a while. After some time, I realised I’d plateaued in my progress and my fitness routine had become exactly that: a routine. I cannot stress enough how great this experience has been for me. I’ve passed my plateau and am feeling stronger than ever and am ready to keep pushing the bar higher. I’d do it all over again in a heartbeat. If Fit 4 The Beach has inspired you to have an active lifestyle but you are not sure where to start, the Kent Sport fitness team can give you expert advice – ask about the personal training and fitness consultations. To stay up to date with Kent Sport news and events, Like UniKentSports on Facebook and follow us on Twitter.